What make this album stand a bit aside from other Royal Hunt albums are the very clear vibe of early 70’s rock that goes like a red cord through the album. It gives it a very nice feel without being in any way 70’s pastiche. For fans of rock from the early 70’s and bands like Deep Purple, Kansas and Uriah Heep it is simply an awesome piece of work and one could interpret this album as the bands homage to that period. 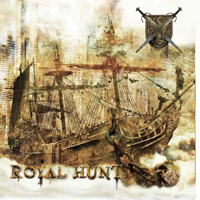 Their love for all the awesome music that came out in those days is very clear and the mix between the sound of then and a modern and very relevant progressive band like Royal Hunt are a very successful mixture. As the name suggest “X” is the tenth album from Royal Hunt but only the second with lead singer Mark Boals. Some people were not too excited by his performance on the last album, but I can assure you that Mr. Boals are doing an excellent job on this album. Every song is like tailored to his voice and that make for a very pleasant listening experience. I can’t really recommend any tracks from the album since all of them are more than rock solid. All I can do is to recommend the whole album to lovers of both progressive rock/metal and of classic hard rock.